Calgary, AB (CKLQ) - The Brandon Bobcats men's volleyball team has figured out their opponent for the Canada West semi-finals. 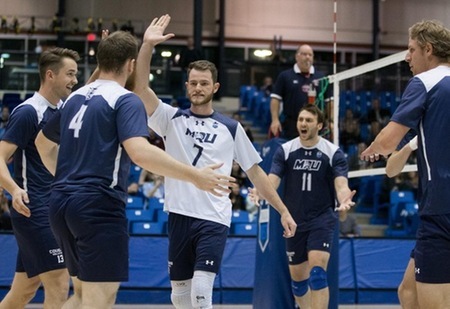 With a four set win over Saskatchewan on Saturday, the Mount Royal Cougars will be heading to Brandon this week to take on the Bobcats. The Cougars swept the Huskies in two games in the best of three. Even they are the fourth seed in the Canada West, Mount Royal has been the only team to beat the Bobcats this season, when they did it twice in November. Game 1 is on Thursday at 7:00 p.m, with Game 2 and Game 3 on Friday and Saturday if necessary. Elsewhere in the Canada West playoffs, the Alberta Golden Bears were upset by Thompson Rivers by being swept in two games. Elsewhere the #2 Trinity Western Spartans will advance to the semis after beating the reigning national champions UBC Thunderbirds in three games.